J’ai commencé a travailler à Nagoya il y a 2 semaines. Je ne suis pas encore habitué à la vie travaillant parce qu’il est très différent avec la vie à l’école. Mais mes patrons sont très sympathiques. Vendredi soir, mon patron m’a invité à une fête. Je ne savais pas que types de fête est-il mais j’étais d’accord parce que je n’ai pas eu faire les soirs. Je suis allé à un bar sport, et je lui ai attende. Quand il est arrivé, je me suis rendu que c’était une fête organisé pour La Société Canadienne Tokai Japon et le ministre d’affaires commerciales de l’ambassade du Canada et le consul et délégué commercial principal du consulat du Canada sont venu aussi. J’ai été surpris et je ne savais pas que je n’ai jamais cru que je rencontrerais de tels gens. Je me suis passé très bien vendredi soir. As we gear up to embrace the imminent typhoon tailgating closely behind, we bid farewell to the last bits of summer still stubbornly parasitizing and not reading the air. Finally, after a long exhausting summer that lasted longer than previous years, we are to welcome the autumn season. In Japan, there is a myriad of ways to describe, or spend autumn. Autumn of appetite, autumn of sports, autumn of music and so on. One of my favourite ways to spend autumn is to spend it in style, or more accurately in the Japanese oshare style. Oshare is the Japanese word for “stylish” or “fashionable”, but it kind of carries a connotation that does not exist in the same word in other languages. Of course there are many ways to interpret the word and different people hold different perspectives, but my interpretation of the oshare style can be experienced if one enters a typical oshare cafe in one of those quiet towns in Japan. 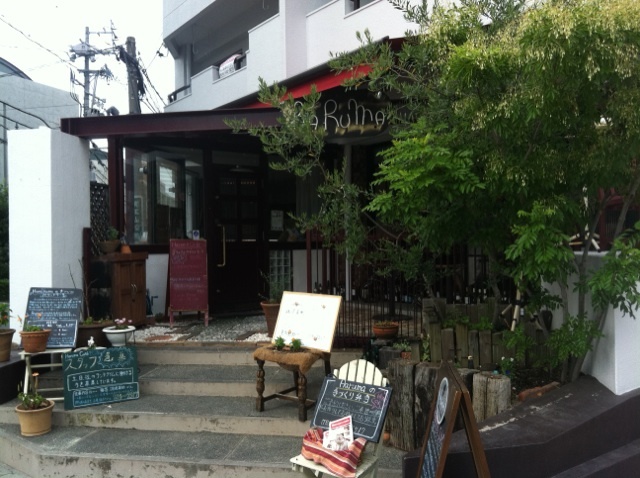 My favourite oshare towns in Tokyo include Daikanyama, Shimokitazawa and so on. Having moved to Nagoya for work less than two weeks ago, I woke up in the morning realizing that I know nothing about this new city. Summer is almost over and we no longer have to bear the scorching heat. And so I decided to expand my knowledge and map of Nagoya. Higashiyama line apparently is the oshare line that connects the oshare towns, just like how the Toyoko line in Tokyo does. I embarked on a journey out of the city centre of Nagoya for the first time since I moved here, and arrived at Kakuozan. What greeted me as I stepped out of the elevator from the subway was a pleasant surprise- the epitomes of a stylish town: Serenity, self-owned cafes, shops that sell random things. Ironically, the abundance of land in Nagoya had a reverse impact on the towns. In contrast, the narrow streets in Tokyo actually give it a sense of mystery and adds to the stylishness of the town. Nevertheless, I strolled down the streets of Kakuozan and was awed by the little shops I passed by. A shop selling a wide variety of tea, another selling all kinds of curry, a shop selling beads, and a French restaurant that broadcasted a French radio program. 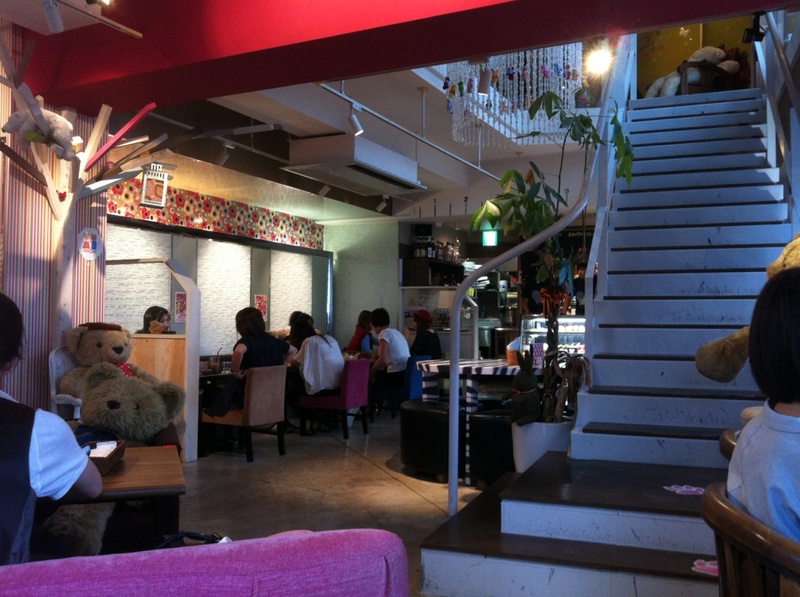 I entered a restaurant for lunch and was immediately overwhelmed by the tranquil atmosphere. There were only 3 other customers, I observed as I was ushered to my seat. 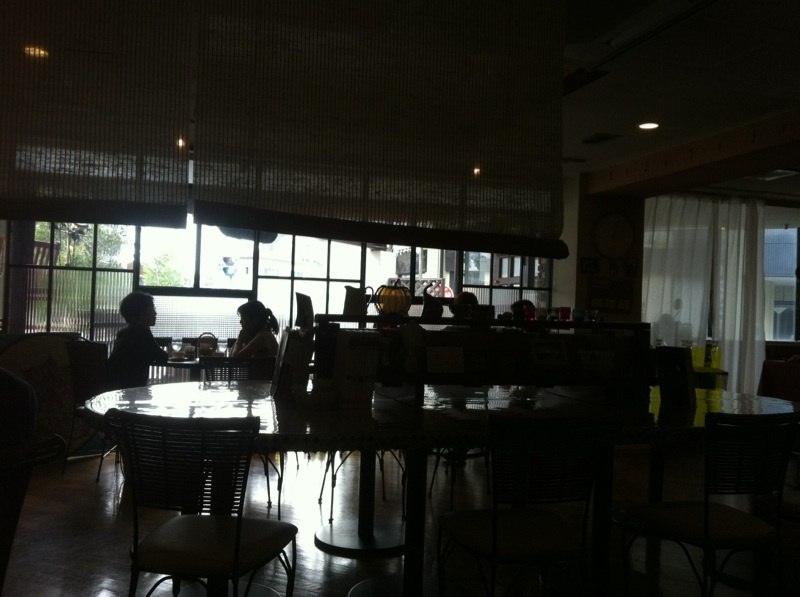 The typical scenes in an oshare cafe: The silent couple that would sip their coffee without speaking a word. The group of ladies that would chat and giggle in a restrained voice so that they would not disturb the others. The loner who sits at his seat, observing the surroundings, reading a book or just staring into space- who happened to me this time. Food in such restaurants are often of good quality- not ready-made food heated in a microwave oven. 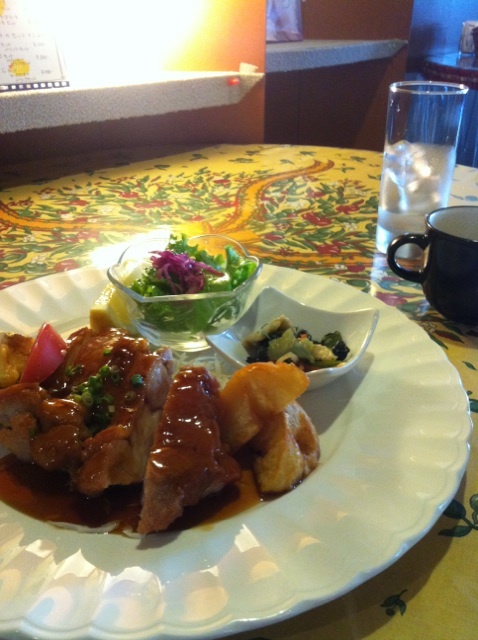 I had a stylish lunch, thanks to the serenity, the soothing background music, and great food. After which I returned to Sakae, the bustling city of Nagoya, where I chanced upon an interesting cafe of which I could not resist but enter. 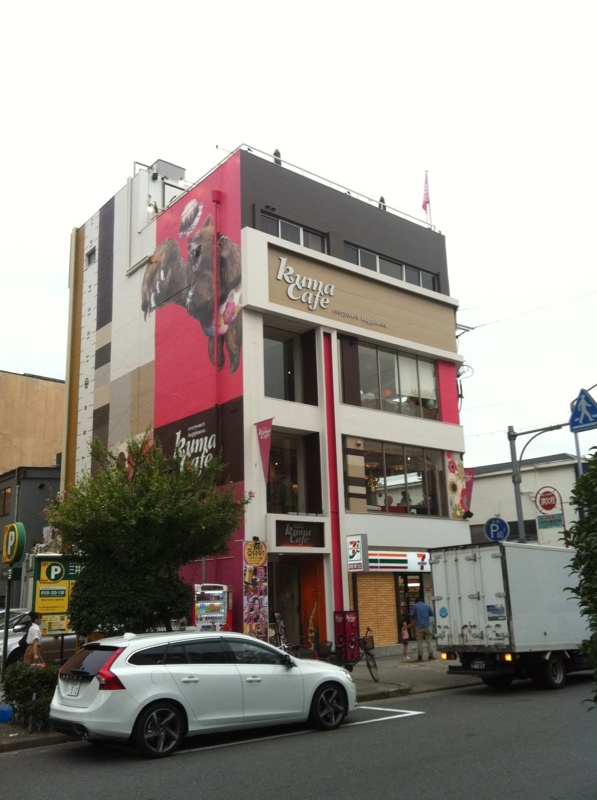 Welcome to Kuma Cafe, or the Bear Cafe. 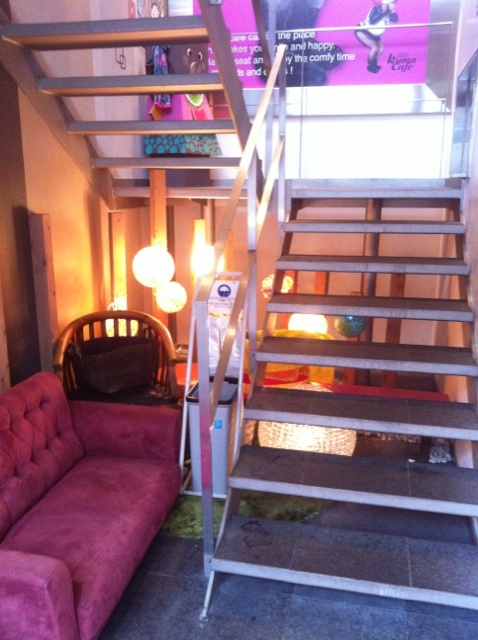 Sounds childish, but I was impressed as I opened the door and was greeted by what else- a huge teddy bear, a pink sofa and a stylish staircase that leads to the second floor. 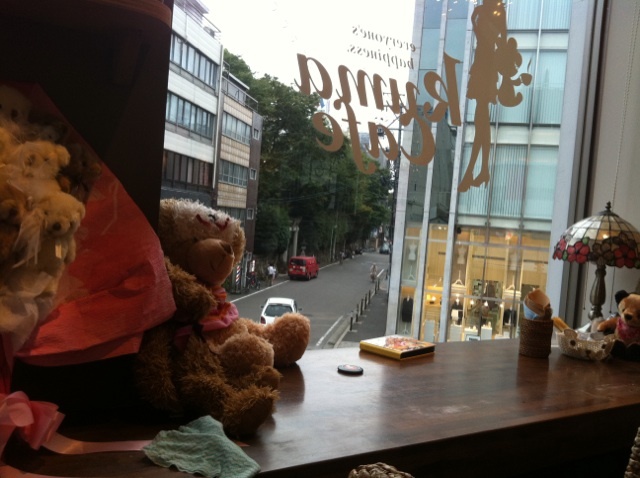 And as with most stylish cafes, it is populated by couples on a date, groups of girls gossiping, and people like me who come just to have a oshare stylish afternoon. Hoy es el primer fin de semana después de hacerme uno “salaryman” en Japón. El “salaryman” significa alguien que trabaja en una oficina en Japón. Como lo que se escribe, lo que hace es ganar dinero. El “salaryman” no tiene una connotación buena porque el imagen de él es que trabaja demasiado, no tiene tiempo para su familia o novia, empiece el trabajo muy temprano y termina muy tarde. Si estar un “salaryman” es tan duro, ¿por qué elijo de hacerme uno? Bueno, quiero tener experiencia de trabajar en Japón y además el compañía en la que trabajo no es una muy japonesa. No trabajamos hasta muy tarde. Y la manera de trabajar es muy occidental. Tuvimos una conferencia hace unos días y me sorprendí que mis jefes hablan ocasionalmente. Por supuesto la carga de trabajo no es ligero, pero me gusta la manera de trabajar. Es la primera semana todavía y sé que el trabajo va a ser más duro que ahora. Espero que puedo acostumbrarme al trabajo temprano. Ich habe meine neue Arbeit diesem Dienstag angefangen. Die ist meine erste Arbeit und dann habe ich keine Erfahrung. Der Chef der Gesellschaft ist aus Amerika obwohl die Gesellschaft eine Japanische ist. Die meisten Arbeiter sind Japanische aber die Menschen in meiner Abteilung sprechen sehr gut Englisch. Es gibt ungefähr 1000 Arbeiter zusammen in die Gesellschaft. Heute war meine dritte Tag bei der Arbeit und bis jetzt freue ich mich darüber. Ich weiß dass, meine Arbeit nicht leicht sein wird.